TS Radhakrishnaji is a legendary composer of devotional music. One will be hard pressed to find a devotee who has not been captivated by his music. Many a popular song - 'Oruneram Enkilum Kanathe Vayyente', 'Mookambike Devi Jagadambike', 'Ambalapuzhayil Enn Manassodi', 'Vadakkum Natha Sarvam Nadathum Natha', 'Thirunakkara Thevare', that lit the minds of a Malayalee, has been composed by TS, as he is popularly known. 'Tyagabrahmmam', musical group formed by him has performed in temples and piligrim centers all over the world. 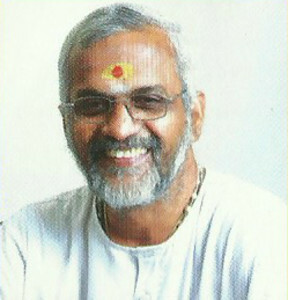 He was honoured with 'Bhakthi Gana Sudhakara' title by Thamaramkulangara Ayyappa Seva Samithi in 2002. In 2006, the Ernakulam Grama Jana Samooham conferred him with the title of 'Bhakthi Ganopasaka Sri'. He was the first recipient of 'Harivarasanam' award. 'Sangeetha Kousthubham' and 'Ayyappa Gana Sri' - the list of titles and honours goes on.